The pecan tree, Carya illinoinensis, produces the buttery flavored nuts made famous by pecan pie, a favorite dessert in North America. The trees are native to much of the United States and Canada, growing in plant hardiness zones 5B to 9A. In the pecan orchards of Texas, Florida and other southern states, commercial producers are very familiar with the inherent challenges presented by growing pecan trees. Perhaps the greatest of these is the natural zinc deficiency that affects this species. Native pecan trees have difficulty absorbing zinc, which can lead to a number problems for commercial growers. 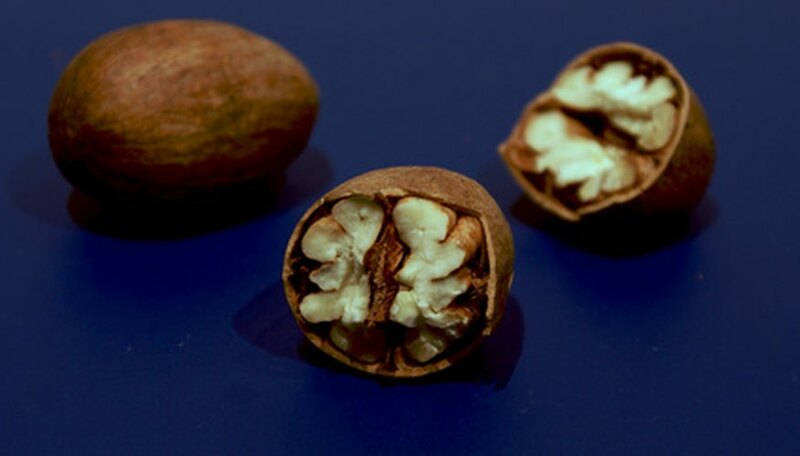 However, according to an article by George McEachern, extension horticulturist with Texas A&M University, the inability of the pecan tree to absorb zinc is a natural survival strategy. The lack of zinc causes mature trees to shed their fruit and inhibits vigorous growth. This allows the trees to conserve energy and water in order to endure the drought conditions that frequently occur in their native habitat. The signs of zinc deficiency in pecan trees are usually noticeable in the foliage. Leaves may be stunted and curved or may have wavy edges rather than the normal serrated margins. Discoloration of the leaf veins where they become much darker than the rest of the leaf is another telltale indication of insufficient zinc absorption. Another symptom of the problem is irregular shoot growth whereby new shoots emerge from the stem in bunches rather than singly. Applying zinc sulfate is the standard method of treating zinc deficiency in pecan trees. Determining the pH level of the soil is the key to selecting the right approach. Acidic soils with a pH of less than 6.0 will respond to direct application of zinc sulfate by spreading it around the tree. The recommended annual dosage is one half pound of zinc sulphate per year of tree age to a maximum of 10 pounds. Alkaline soils will not respond to zinc sulfate applied directly to the ground. Carbonates found in high pH soil will bind the zinc sulfate into complexes that are not water-soluble. Spraying is the recommended method of application in this case. Add 2 pounds of zinc sulphate per 100 gallons of water and spray the foliage three times in spring when the trees start to bud. Additional applications should be made as new foliage develops. Although applying zinc sulfate will encourage vigorous growth of foliage and fruit, it can also cause pecan trees to become stressed. Since zinc deficiency is a natural survival strategy for pecan trees, treatment with zinc can weaken the trees by encouraging excessive growth of foliage and fruit. In essence, the added zinc allows the trees to put too much energy into new growth at the expense of maintaining the health of the whole plant. Therefore zinc sulfate is best applied when the other needs of the tree have been addressed. These needs may include water availability, fertilizer treatment and soil amendment.